Genoa, Italy's largest seaport city, has a fascinating aquarium, an interesting port, and a historic center said to be the largest medieval quarter in Europe, with a wealth of churches, palaces, and museums. 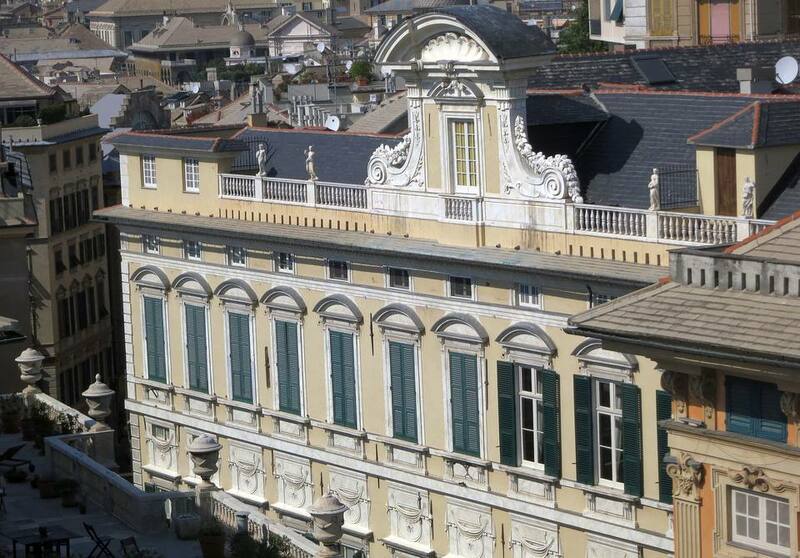 Genoa's Rolli Palaces are on the list of UNESCO World Heritage Sites. Genoa is on the northwest coast of Italy, the part known as the Italian Riviera, in the region of Liguria. Genoa is a train hub and can be reached from Milan, Turin, La Spezia, Pisa, Rome and Nice, France. The two train stations, Principe and Brignole are both in central Genoa. Buses leave from Piazza della Vittoria. Ferries leave from the port for Sicily, Sardinia, Corsica, and Elba. There's also has a small airport, Cristoforo Colombo, with flights to other parts of Italy and Europe. Genoa has a good local bus service. Local ferries go to towns along the Italian Riveria. From Piazza del Portello you can take the public elevator to go up the hill to Piazza Castello or the funiculare to go up to Chiesa di Sant'Anna where a good walking path descends from the church. The medieval part of the historic center is best visited on foot. Find a recommended place to stay with these Genoa hotels on Hipmunk. There's a walking path along the scenic spruced-up port area. Get a bird's-eye view of Genoa by going up in the Bigo, a panoramic capsule that takes you up above the port. The early 13th-century San Lorenzo Cathedral has a black and white striped marble facade. Palazzo Reale, on Via Balbi, is a stunning mansion that's been turned into a museum with a collection of art and furniture from Genoa's sea exploration era. The Renaissance and Baroque Rolli Palaces, in Genoa's center, were added to the list of UNESCO World Heritage Sites in 2006. About 80 Rolli palaces were built in the 16th century, when Genoa was one of Italy's four great maritime republics. Many of them were restored in 2004. You'll find them on the pedestrian street of Via Garibaldi, formerly Strada Nuova. The 16th-century Palazzo Bianco has a great collection of paintings by Genoese and other European artists. The carruggi, narrow alleys, are interesting to wander around (take a map, you can get lost easily). The Aquarium of Genoa, built for the EXPO 92, is the second largest in Europe. Teatro Carlo Felice is one of Italy's top historic opera houses. See schedule or buy tickets on Select Italy. The National Gallery in the Palazzo Spinola has original furnishings from the 16th-18th centuries, frescoed ceiliings, and an excellent collection of art. From Piazza Castello there are fabulous views of the port and city (take the public elevator). Beautiful Liguria offers a great insider's tour of Genoa or other parts of the Italian Riviera. See Genoa Travel Weather and Climate to plan when you want to visit and see a map of the city. The historic regatta, one of Italy's most exciting, is held the first weekend in June every fourth year. Boatmen from the ancient maritime republics of Amalfi, Genova, Pisa, and Venezia compete (the festival rotates amongst these cities). There is a jazz festival in July. The statue "Christ of the Depths", underwater at the bay's entrance, is celebrated at the end of July with a Mass, the illumination of the reefs and a line of underwater torches to show the way to the statue. Genoa is famous for pesto (basil, pine nuts, garlic, and parmigiano cheese) usually served over trenette or trofia pasta cooked with potatoes and green beans. Being a port city, you'll also find good seafood dishes such as the fish stew buridda. Cima alla Genovese is veal breast stuffed with organ meats, herbs, vegetables, and pine nuts, served cold. The Genoa portion of the Italian Riviera has several interesting villages, ports, and resorts. Most can be reached by train, bus, or ferry from Genoa. Portofino, Rapallo, and Camogli are three of the most popular destinations. See our Italian Riviera Itinerary for more about where to go. What's the Best Way to See the Italian Resort Town of Portofino?